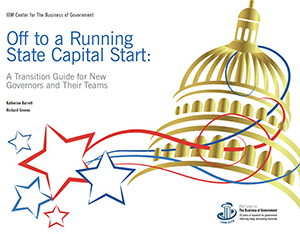 The transition team and incoming administration leaders must actively engage legislators and other elected leaders early in the transition to establish a collaborative and productive relationship. This sets the stage for the kind of buy-in that leads to positive results. The incoming administration should treat the initiatives of previous administration with respect and eschew the temptation to change for change’s sake. Even when there has been a shift in political affiliation, successful policies and programs should be given the opportunity to move forward. The incoming administration must build relationships with other levels of local and federal government, and with career staff already in the state government. The transition team should steep itself in the state’s history of management reform, including efficiency commissions, performance audits, and studies or reports published by oversight bodies. The transition team and incoming governor should examine the topics most recently selected by the legislature for interim committee work, prior to the upcoming legislative session. The transition team should quickly strive to achieve a solid understanding of the recent history of technological change, attitudes and approaches to swiftly shifting technology roles, possible technological barriers, and the potential for technological advances and integrated data. The incoming administration should encourage appointees and career staff to experiment with new processes and programs, and to accept the failure that inevitably accompanies innovative thinking. Successful leaders encourage risk-taking and experimentation. The reaction to failed innovation should be supportive and ameliorative, not punitive. The incoming administration should establish a means for keeping close track of the efforts underway during the transition, and should make sure that all parties involved are clear as to what has been accomplished, what has fallen through the cracks, and what has been tried but failed. The report details ways to accomplish these pieces of advice and also includes helpful hints to incoming state agency heads as well as links to a handful of important resources for additional details.